On the left, an image of comet Holmes from the 3.6-meter Canada-France-Hawaii telescope showing the large expanding dust coma. On the right is shown the same image after application of the Laplacian spatial filter, to emphasize fine structures. A comet recently spewed out a cluster of mini comets in ahuge outburst that was the largest ever witnessed by astronomers. A team of researchers began observing the comet17P/Holmes in October 2007, after it was reported that the object, about2.2 miles wide (3.6 km wide), had brightened by a million times in less than aday. UCLA researcher Rachel Stevenson and colleagues notedmultiple fragments flying rapidly away from the comet's nucleus. They continuedobserving for several weeks after the outburstusing the Canada-France-Hawaii Telescope in Hawaii and watched as the dustcloud ejected by the comet grew to be larger than the sun. 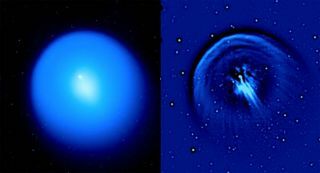 The astronomers examined a sequence of images taken overnine nights using a digital filter that enhances small features. They foundnumerous tiny objects that moved away from the nucleus at speeds of up to 280mph (125 meters per second). These objects were too bright to simply be barerocks, but instead were more like mini comets, creating their own dust clouds asice on their surfaces sublimated directly to vapor. "Initially we thought this comet was unique simplybecause of the scale of the outburst," Stevenson said. "But we soonrealized that the aftermath of the outburst showed unusual features, such asthese fast-moving fragments, that have not been detected around other comets." Although the outburst was impressive in the telescopeimages, it wasn't visible to the naked eye. Scientists aren't sure of the exact cause of the outburst. Possibly,pressure inside the comet built up as it moved closer to the sun, untileventually part of the surface broke away, releasing a huge cloud of dust andgas, as well as larger fragments. Even after ejecting mini comets, the solid nucleus of cometHolmes survived and continued on its orbit, seemingly unperturbed. Holmes takes about 6 years to circle the sun, and travelsbetween the inner edge of the asteroid belt to beyond Jupiter. The comet is nowmoving away from the sun but will return to its closest approach in 2014, whenastronomers will examine it for signs of further outbursts. Stevenson will present the findings at the EuropeanPlanetary Science Congress in Potsdam, Germany on Wednesday.